KFAR SABA, Israel — An early morning rocket from the Gaza Strip struck a house in central Israel on Monday, wounding seven people, an Israeli rescue service said, an attack that could set off another round of violence shortly before the Israeli election. The sounds of air raid sirens woke up the residents of the residential Sharon area, northeast of Tel Aviv, sending them scurrying to bomb shelters. A strong sound of an explosion followed. The Israeli military said it identified a rocket fired from the Gaza Strip. 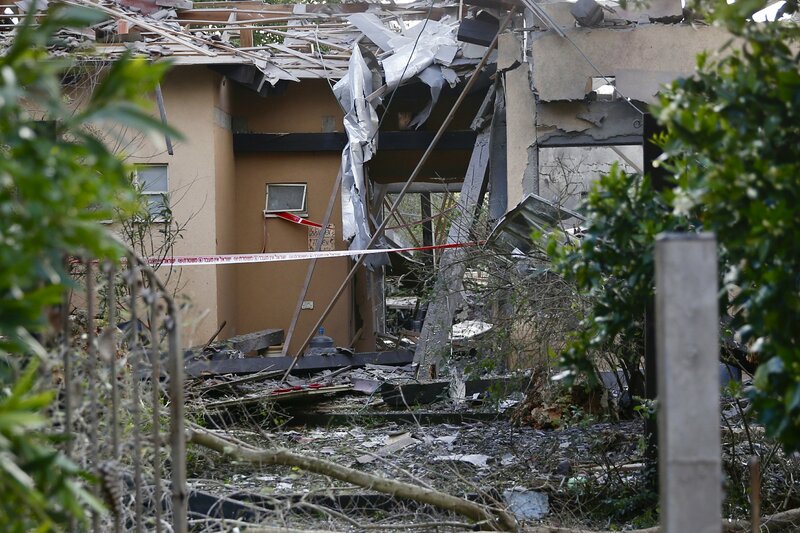 Israeli police said the rocket hit a residential home in the community of Mishmeret, north of the city of Kfar Saba, setting off a fire and destroying the house. The attack comes 10 days after rockets were fired toward Israel’s densely populated commercial capital of Tel Aviv. The Israeli military at the time struck back in Gaza and the sides appeared to be hurtling toward another confrontation. But Gaza’s Hamas leaders said the rocket was fired accidently and calm was quickly restored. There was no immediate claim of responsibility to Monday’s attack, but it would seem to be much harder to dismiss the latest incident as another misfire. Gaza is controlled by Hamas, an Islamic militant group that seeks Israel’s destruction and possesses a large arsenal of rockets and missiles capable of striking deep inside Israel. The territory is home to other militant groups, including Islamic Jihad, an Iranian-backed armed organization that also has a formidable rocket arsenal. Israel holds Hamas responsible for all fire coming out of the coastal territory. Israel and Hamas are bitter enemies and have fought three wars since the militant group seized power in the strip in 2007. Smaller flare-ups have occurred sporadically since Israel and Hamas fought their last war in 2014. The outburst comes at a sensitive time for both sides. Israel is holding national elections in 15 days. Prime Minister Benjamin Netanyahu is locked in a tight fight for re-election and could face heavy criticism from his opponents if he is seen as ineffective against the militants. Netanyahu is currently in Washington, set to meet later in the day with President Donald Trump. His chief opponent, Benny Gantz, called on him to return home immediately to deal with the crisis. In Gaza, Hamas has come under rare public criticism for the harsh conditions in the territory. An Israel-Egyptian blockade, combined with sanctions by the rival Palestinian Authority and mismanagement by the Hamas government have fueled an economic crisis in the territory. Residents have little desire for another war with Israel.